272 pages | 15 B/W Illus. While most of Asia’s major cities are increasingly homogenized by rapid economic growth and cultural globalization, Rangoon, which is Burma’s former capital and largest city, still bears the imprint of a unique and often turbulent history. It is the site of the Shwedagon Pagoda, a focus of Buddhist pilgrimage and devotion since the early second millennium C.E. that continues to play a major role in national life. In 1852, the British occupied Rangoon and made it their colonial capital, building a modern port and administrative center based on western designs. It became the capital of independent Burma in 1948, but in 2005 the State Peace and Development Council military junta established a new, heavily fortified capital at Naypyidaw, 320 kilometers north of the old capital. 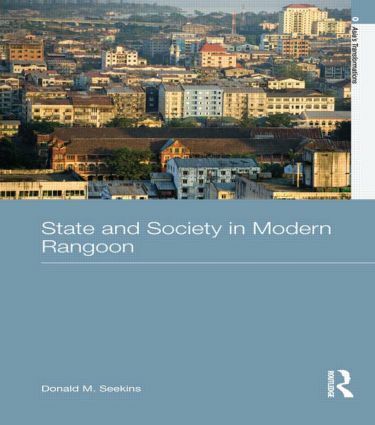 A major motive for the capital relocation was the regime’s desire to put distance between itself and Rangoon’s historically restive population. Reacting to the huge anti-government demonstrations of "Democracy Summer" in 1988, the new military regime used massive violence to pacify the city and sought to transform it in line with its supreme goal of state security. However, the "Saffron Revolution" of September 2007 showed that Rangoon’s traditions of resistance reaching back to the colonial era are still very much alive. Donald M. Seekins is Professor of Southeast Asian Studies at Meio University in Okinawa, Japan, and has been researching the contemporary politics and society of Burma since 1988. His books include The Disorder in Order: the Army-State in Burma since 1962 (2002), The Historical Dictionary of Burma (Myanmar) and Burma and Japan since 1940: From ‘Co-Prosperity’ to ‘Quiet Dialogue’ (2007). The books in this series explore the political, social, economic and cultural consequences of Asia's twenty-first century transformations. The series emphasizes the tumultuous interplay of local, national, regional and global forces as Asia bids to become the hub of the world economy. While focusing on the contemporary, it also looks back to analyze the antecedents of Asia's contested rise. Asia's Transformations aims to address the needs of students and teachers.